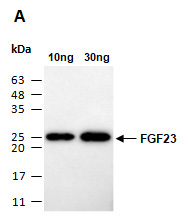 Fibroblast growth factor 23 (FGF23) is a member of the FGF family. Members of this family are capable of broad mitogenic and cell survival activities and are involved in a multitude of biological processes including embryogenesis, cell growth, morphogenesis, tissue repair, tumor growth and invasion. FGF23 inhibits renal tubular phosphate transport by reducing SLC34A1 levels. This gene was identified by its mutations associated with autosomal dominant hypophosphatemic rickets (ADHR), an inherited phosphate wasting disorder. Mouse monoclonal antibodies were produced by immunizing animals with a GST-fusion protein containing the C-terminal region of human FGF23. Antibodies were affinity purified from hybridoma cell culture supernatant. Supplied in 1 x PBS (pH 7.4), 40% Glycerol, 0.02% Thimerosal. Store at -20 °C. Stable for at least 6 months from date of receipt. Suitable for using as ELISA capture or detection antibodies. Ab (M0010-1-TC) at RT for 2 h.